When I was little I had nystagmus and amblyopia. I wore thick “coke bottle” glasses but my family never referred to me as blind. As a result, I would run into a wall, look confused, and potentially hit the same wall again. I just “couldn’t see well.” At least that’s what the adults whispered. This, as they quietly debated the likely cuteness factor of a toddler with big glasses running into walls. At around 4 years old I had eye surgery that supposedly fixed my problems. Sure, I periodically had to wear eye patches while reading or playing a computer game. This was more pleasant as my grandmother made me beautiful fabric ones to wear, but it hurt though. I never liked this because trying to read like that always hurt and I was so sleepy afterward. However, my parents said this would help so I could maybe someday do things like driving or getting a job. Eventually, the longer I did this cycle, the shorter it became between times I’d have to wear eye patches again. Then the light sensitivity I had started increasing as well after my surgery. Pretty soon I was wearing sunglasses and hats most of the time and having to use patches pretty often. By this time, I was in college and studying to be a chemist. The sunglasses caused some issues with goggles as everything polarized and I lived in a world full of rainbows. I learned ways of coping with a portfolio of colored papers to put behind things. I’d shuffle through them until I found the perfect one for that experiment but it was slow and ineffective. My advisor suggested I talk to Dr. Cary Supalo, a blind chemist, to learn adaptations to help me become more effective. I learned some non-visual techniques which greatly helped my productivity. Over time, after my transfer to Rockhurst University in Kansas City, Missouri I relied more on non-visual techniques. Everything looked strange to me. I noticed more issues until I ended up walking straight into the family car because I didn’t see it. At this point, for lack of better words, it hit me: I was going blind. I started walking with a long white cane and learning braille. Then I joined the National Federation of the Blind and for the first time, it didn’t matter how much or little vision I had. There was no need to pretend I could see more than I could. I was accepted even though my doctors didn’t know what was going on. Eventually, we learned I had a cortical visual impairment. My doctor’s best guess was that when my eyes were physically fixed my brain didn’t fully get the message. Because of this, it was as if I never had surgery and my original conditions were left to progress. Despite this, I graduated with my Chemistry degree, then went to the Colorado Center for the Blind to learn more blindness skills. I am currently in graduate school working towards a PhD in Chemistry Education. Since I have discovered myself in my blindness things have been the very opposite of dark. 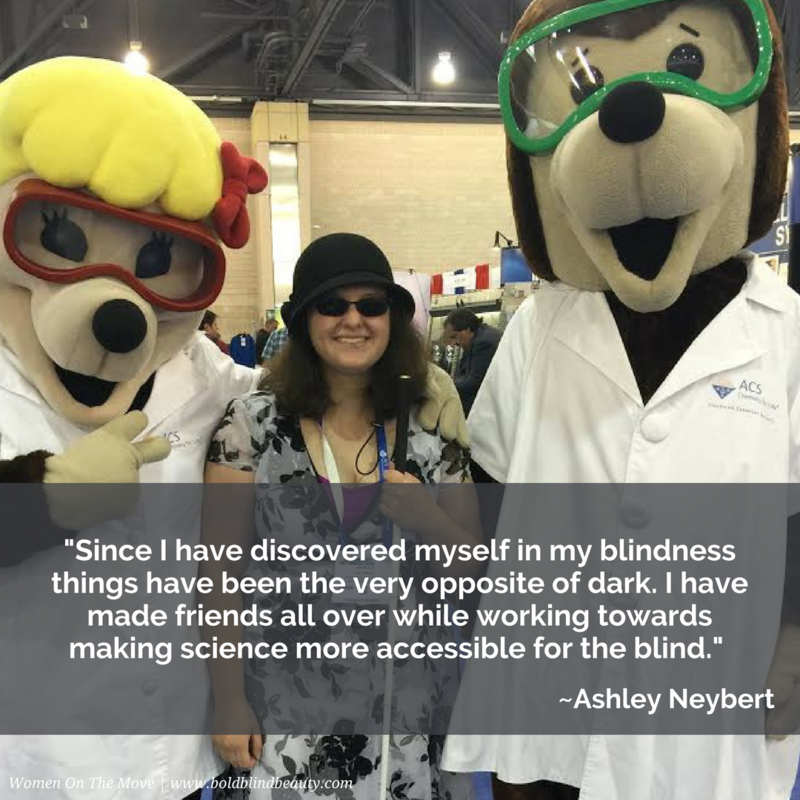 While working towards making science more accessible for the blind, I have made friends all over. In an effort to help others find confidence in themselves regardless of their situation, I have had the opportunity to do speaking engagements. I am also striving to do research to help the blind make their mark in science. In working towards my goals no matter what I have never been one to back down. I may do things differently, but as it turns out, different is not so bad. Ashley wears a cute black and white floral dress with a black cloche hat, sunglasses, and black ballet flats proudly holding her white cane. She is standing between two mole animals dressed as Chemists wearing lab coats and goggles. A pun on the Chemistry unit mols. The photo of Ashley is in boldblindbeauty.com’s WOTM template. The entire template contains the photo and a transparent gray overlay with the quote in white text is near the bottom. A headshot of Ashley holding her white cane. She wears a purple shirt, sunglasses, and a black cloche hat. Her cane is visible and she is sitting on a bench in Hawaii with tropical foliage behind her. Ashley in black and white flower print shirt and black cloche hat and shades feeling a tactile graph of voltage over time made from her Talking LabQuest equipment. Very powerful story Ashley. I found that once you accept and embrace your blindness, you no longer are liiving in the “dark.” But rather, exploring and discovering a whole new world of new sounds and things to feel, smells, and tastes, with the help of amazing non-visual tools. Thank you for commenting Carla. I like how Ashley kept going regardless of what was happening with her sight loss. She never skipped a beat.